What role does gesture play in growing and sharing knowledge? Living Data is an independent programme for making known understandings that evolve from interactions between scientists and artists. An on-line doctoral study of how animation can be used to combine scientific data and subjective responses to Antarctica, completed in 2010. The doctorate was administered through the College of Fine Arts, University of New South Wales, Australia, and supervised by Dr Simon Pockley and Mr John Hughes. and an installation of Antarctic art in mixed media, developed through a Fellowship with the Australian Antarctic Division and funded by the Australia Council's New Media Fund. An animated Antarctic Journal on CD-ROM. Commissioned by the Australian Antarctic Division. 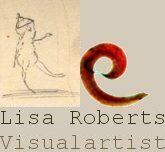 An animated interactive CD-ROM, Roget's Circular, and associated art work were developed in collaboration with Tasmanian artist Melissa Smith and exhibited at Gallery 101, Melbourne, as part of the Centenary of Federation celebrations in 2001. The CD-ROM was integrated with the Macquarie Thesaurus and published by Macquarie Library in 2000. An interactive CD-ROM developed in collaboration with the Flinders Island community, led by Annabel Apps, as an Identity Distinct project, funded by Tasmanian Regional Arts through the Australia Council for the Arts. Transformations (Animated installation), for the Eora Aboriginal Cultural Arts Exhibition, Carriageworks, Sydney. Ocean Light Projections: Transformations, Ambient Boomerang (Animated installation), for the Boomerang Alliance Inaugural Conference, Darling Harbour, Sydney. Antarctic Journeys, paintings, Meadowbank Gallery, Tasmania. Antarctic Winter Festival, Antarctic journal and pastel drawings, State Library of Tasmania. Terra Incognita, drawings, paintings, and interactive CD-ROM work in progress, Snakepit Gallery, Tasmania. Gallery 101 , film, drawings and paintings, Beware of Pedestrians, Melbourne. Fourth Australian Contemporary Art Fair, film, The Infinite Tree , Royal Exhibition Buildings, Melbourne, represented by Gallery 101. Becket Theatre, Malthouse, Melbourne, and the Australian National Gallery, Virtual Reality Biennale, Canberra. Computer Animations, Green Mill National Dance Project, Merlyn Theatre, The Malthouse, Melbourne. Computer animation and digital prints, Third Australian Contemporary Art Fair, Royal Exhibition Buildings, Melbourne, represented by Gallery 101. Sessional lecturer, History of Dance Education, University of Tasmania, Launceston. Part-time teacher, Art and Media Studies (Animation), Wesley College, Prahran. Curator, Bitmap 101 for the Art and Technology Programme of the Next Wave Festival. Curator, Bitmap 101 - National Exhibition of Electronic Art, Next Wave Festival, Gallery 101, Melbourne. Judge, ATOM Film Awards (Animation), Melbourne. Co-Curator; ArTech, Next Wave Festival, for Great Hall, National Gallery of Victoria. New Media Resources Developer, The Animation Network, Melbourne. Assessor, Australian Film Commission, New Image Research Program. Background Artist, The Greatest Tune on Earth, Children's Television Foundation. Animator, People First of Australia Unit. Animator of front credits, The Damnation of Harvey McHugh, ABC TV. Writer, Electronic Arts, Australian Multimedia Magazine (Sydney). Judge, ATOM Film awards (Innaugural Interactive Media awards), Melbourne. In kind support for Living Data, from Lynchpin: The ocean project, ArtCop21: Cultural program for Paris climate, Climarte: Art for a safe climate, Wacom, Benq Australia. Australian Antarctic Arts Fellowship, Aurora Australis V7. Macromedia sponsorship for Antarctic residency, Aurora Australis V7. Computerland, Autodesk and Macromedia sponsorships for interactive CD-ROM, Terra Incognita. Melbourne Fringe Festival Special Commendation Award, for film, Beware of Pedestrians. Australian Film Commission grant for film, Beware of Pedestrians. Redflex touch screens sponsorship for touch screen installation, The Perfect Dream and the interactive CD-ROM, Roget's Circular. Australian Film Commission Grant for film, Sophie. Telematics Trust Grant development funding for educational software in computer animation. Australian Film Commission post-production grant for film, Still Lives. Australian Film Institute grant for film, Still Lives. National Gallery of Victoria Drawing Prize. Roget's Circular, CD-ROM author Lisa Roberts, with art work by Lisa Roberts & Melissa Smith, illuminating the Macquarie Thesaurus. Pub. Macquarie Library, Australia. Catalogue: Workings of the Mind - Melbourne Prints 1960s to the 1990s. Dance Therapy Redefined, by Johanna Exiner and Dennis Kelynack with Naomi Aichison and Jenny Czulak, illustrated by Lisa Roberts, Pub. Charles C. Thomas, Springfield, Illinios, USA. Australian Contemporary Art Fair Catalogue. Next Wave Art and Technology Catalogue. Australian Art & Artists, by J. Rollinson and S. Melville; Science Press, Australia. Picture This, Careers in Visual Arts, Crafts & Design, Arts Training Victoria, pp. 36-7. Interacta, No. 3992, A.C.T.A. journal, pp. 21-3. Lowdown, Vol. 14, Youth Performing Arts 5, pp. 7-11. A Buyer's Guide to Australian Art, by Graham Ryles, Mandarin Books. Australian Women Artists, by Max Germaine. Drawing in Australia, by Janet McKenzie, Macmillan Australia. Encyclopedia of Australian Art, Vol.11, Alan McCulloch, Hutchison, Australia, p. 1031. Joey's Eggshell People, by Tony Scanlon, illustrated by Lisa Roberts; Oxford University Press. Cinema Papers, April - June, Issue 16.